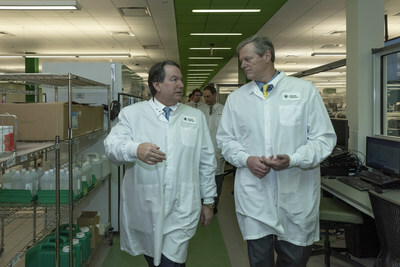 MARLBOROUGH, Mass., April 1, 2019 /PRNewswire/ -- Quest Diagnostics (NYSE: DGX), the world's leading provider of diagnostic information services, hosted Massachusetts Governor Charlie Baker at its state-of-the-art clinical testing laboratory in Marlborough, Massachusetts on Friday, March 29. 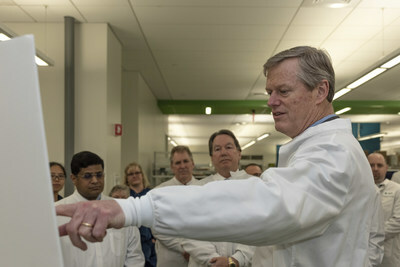 During the visit Governor Baker toured the laboratory, met with employees, and learned more about the company's initiatives in the areas of pricing transparency, Alzheimer's treatment and detection, and combatting the opioid epidemic. Marlborough Mayor Arthur Vigeant joined Governor Baker on the visit. "Thanks to companies like Quest Diagnostics, Massachusetts continues to be a global leader in the innovation and life sciences industry," said Governor Charlie Baker. "We look forward to continuing to engaging with Quest to grow and support globally competitive health care needs here in Massachusetts." The 200,000-square-foot LEED-certified laboratory was built in 2014 and is the largest in the Quest network of more than 20 major laboratory facilities across the nation. Quest supports over more than 50 percent of all physicians and more than 75 percent of acute care hospitals in Massachusetts. "Massachusetts is a great place to do business, and we are grateful for the opportunity to serve more than one third of the adult population in the Commonwealth every day," said Steve Rusckowski, Chairman, President and CEO of Quest Diagnostics. "We are proud to be a part of this community and are committed to many of the health care issues Governor Baker and his team are committed to improving." Quest Diagnostics empowers people to take action to improve health care outcomes. Derived from the world's largest database of clinical lab results, our diagnostic insights reveal new avenues to identify and treat disease, inspire healthy behaviors and improve health care management. Quest annually serves one in three adult Americans and half the physicians and hospitals in the United States, and our 46,000 employees understand that, in the right hands and with the right context, our diagnostic insights can inspire actions that transform lives.